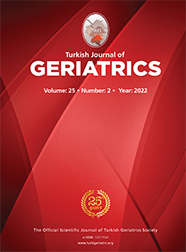 1Afyon Kocatepe University, Faculty of Medicine, Department of Anesthesiology and Reanimation, Afyon, Turkey DOI : 10.31086/tjgeri.2018240423 Introduction: With the advancement in healthcare, the proportion of elderly population is increasing. We aimed to retrospectively investigate intensive care admission, complications, and mortality rates in elderly patients who underwent Endoscopic Retrograde Cholangiopancreatography. Materials and Method: We retrospectively analyzed 1320 patients aged ?65 years who underwent Endoscopic Retrograde Cholangiopancreatography under sedation in our hospital between October 1, 2013 and October 1, 2016. Patients were divided into two groups based on their age: group 1 (65?79 years) and 2 (?80 years). Data on patient gender, American Society of Anesthesiologists (ASA) distribution, early mortality (7 days), postoperative intensive care needs, doses of anesthetic drugs administered, and complications were compared. Results: Comparison of data between groups 1 (926 patients) and 2 (394 patients) revealed that the use of propofol and ketamine was significantly lower in group 2 than in group 1, whereas that of midazolam was similar in both the groups. The number of patients with complications, those requiring intubation, rate of intensive care need, and mortality were significantly higher in group 2 than in group 1; there were no significant differences in the type of complications (cardiac or respiratory) (p=0.198).